In 1987, Ronald Reagan declared that the US was about to enter an incredible new era of technology. Levitating high-speed trains, super-efficient power generators and ultra-powerful supercomputers would become commonplace thanks to a new breed of materials known as high temperature superconductors (HTSC). "The breakthroughs in superconductivity bring us to the threshold of a new age," said the president. "It's our task to herald in that new age with a rush." But 20 years on, the new world does not seem to have arrived. So what happened? Superconductivity was first discovered in 1911 by researchers at the University of Leiden who used solid mercury in their experiments. Superconductors have no electrical resistance, so unlike conventional conductors they allow an electric current to flow through without any loss. At the start, the phenomenon was only seen in materials cooled close to absolute zero, which according to theory is the state of zero heat energy. Three-quarters of a century later, the highest temperature achieved for the onset of superconductivity, the so-called transition temperature, was a frigid 23 Kelvin (-250C). This allowed scientists to exploit the phenomenon in specialist applications such as Magnetic Resonance Imaging (MRI) scanners and high energy physics particle colliders, cooled by liquid helium. But more day-to-day applications, such as replacing the electricity grid with superconducting wires, remained impossible without materials able to operate at higher temperatures. 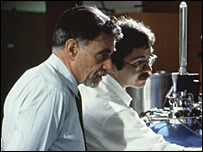 The breakthrough came in 1986. The discovery meant that superconductors had entered the temperature range of liquid nitrogen (77K, -196C), an abundant and well understood coolant. "All of a sudden everything was different," said Professor Chu. "There was a euphoric feeling. People in the field thought nothing was impossible." The discovery prompted a huge gathering of physicists in New York to discuss the breakthrough, a meeting later called the "Woodstock of Physics". But large-scale commercialisation of the technology would prove more difficult. "The material was not as simple as we originally thought," said Professor Chu. Despite an intensive two-decade search, the underlying mechanism of superconductivity in the ceramics is still disputed. In addition, their exact structure, requiring ultra-thin layers of different elements stacked on top of each other, means they are very difficult and expensive to manufacture. "Atomically, you have to line them up very precisely in order for the supercurrent to flow," explained Professor Chu. This, coupled with the fact that ceramics are brittle and difficult to turn into flexible wires and films, meant that prospects for immediate exploitation were not good. "I think the expectations were a little unrealistic," said Dr Dennis Newns of IBM. "The typical time it takes from inventing a new concept to application is 20 years," he said. "And that is exactly what we have seen." Companies in Japan, Europe, China, South Korea and the US are forging ahead with applications. In the US, American Superconductor has developed a way to "bend the unbendable", creating HTSC wires that can carry 150 times more electricity than the equivalent copper cables. "Twenty years ago you would see people making ceramic fibres and trying to bend them and it was like a dry stick of spaghetti," said Greg Yurek, CEO and founder of the company. To get around this brittleness, the company embeds up to 85 tiny filaments of superconducting ceramic in a ribbon of metal 4.4mm (0.17 inches) wide. "Think of optical fibres," said Dr Yurek. "If you have a rod of glass and you whack it on your desk it will shatter. "Drop down to a fine optical fibre and it becomes flexible - it's the same principle here." The company also produces wires with a coating of the ceramic just one micron (millionth of a metre) thick on a metal alloy. Both are cooled by a sheath of liquid nitrogen. Short sections of the wires have already been installed in Columbus, Ohio, and a further half-mile of cable will soon be laid on Long Island, New York. In the short term, longer stretches of the supercooled cable will be difficult to install, as it requires an infrastructure to pump liquid nitrogen around the grid. But Dr Yurek believes that it will not be long before other firms start to offer utility companies these cryogenic services. 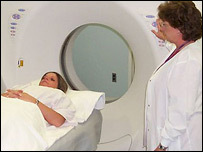 "This is the model they have used in the MRI industry to guarantee the cold," he said. 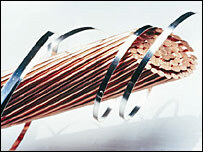 The company also promotes its HTSC wires for other advanced applications. 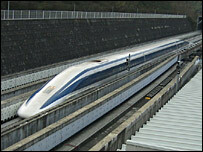 Central Japan Railways uses coils of it for their superconducting experimental magnetic levitation (maglev) train. American Superconductor has also developed an electric motor using coils of superconducting wire for use in the next generation of US Navy destroyers. Electric motors are used by most commercial cruise liners, but are typically very bulky. Using HTSC technology dramatically shrinks their size and also increases their efficiency. The company is just about to start testing its latest 36.5-megawatt engine that is cooled by off-the-shelf liquid helium refrigerators and weighs 75 tonnes. By comparison, an engine based on copper wires would weigh 300 tonnes. "That's great for cruise ships and the navy, because they can use that space for other things like passenger cabins or munitions," said Dr Yurek. Experimentally, things have also moved on. "When we applied pressure we raised it up to 164K (-109C) - that's a record," said Professor Chu. "Of course from an application point of view, it's hopeless." However, other experimental work raises the possibility of discovering room temperature superconductors that would require no exotic cooling equipment. A new theory, outlined in a paper in the journal Nature Physics by Dr Newns and his IBM colleague Dr Chang Tsuei, seeks to explain the elusive mechanism of superconductivity in the class of ceramics discovered in 1986. "We don't see any fundamental limits," said Dr Tsuei. "If someone discovered a room-temperature superconductor tomorrow that fits with what is outlined by our theory, we wouldn't be surprised at all," added Dr Newns. This kind of optimism, seen for the first time in the mid-1980s, now seems to be deserved. There has been a crescendo of research, while at the same time the first commercial HTSC products are rolling out of factories. According to Dr Yurek, this is a sign that the new age promised by Ronald Reagan is finally here. "I think we're on a launching pad here and we're now ready to take off," he said.